« *** WINNER of the VTech V. Reader Giveaway *** Brandi is Living the Life of Riley! Bath time is such a fun time for both parent and child. Playing with your child in the tub, watching them splash around and cleaning their little face and tiny toes are some of the moments I remember fondly of bath time with Riley. But after those 15 minutes are up, what do you do with this large plastic tub? Unfortunately, Riley's infant tub was just too large to store easily in a closet and so for over a year, we had a plastic tub which had found its permanent place on our dining room floor. Not exactly the best look for our dining room! Thankfully, EasyWalker Inc. created a solution to this storage problem when they invented the FlexiBath. Read on to see what my thoughts are about this product. 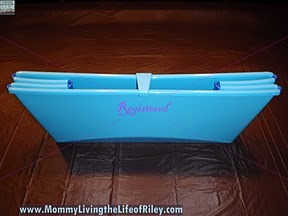 I reviewed the FlexiBath from EasyWalker Inc., which retails for $39.99. You can purchase the FlexiBath now at Amazon.com for $39.95 plus receive FREE SHIPPING! The FlexiBath is one of those great ideas that I wish I would have known about when Riley was smaller. At that time, I used to bathe her everyday in a large plastic tub which took up a ton of space on our dining room floor. Because the FlexiBath folds flat, you can easily store it in an inconspicuous place for the other 23 hours and 45 minutes of the day that you're not using it! I even tried sliding it upright into the space between our refrigerator and the wall and IT FIT! Now, that's handy, compact and extremely convenient. The FlexiBath is constructed from Polypropylene (PP) and Thermoplastic Elastomeric (TPE), which are free from PVC, phthalates, heavy metals and other harmful or hazardous materials. Because the TPE used in constructing the FlexiBath can weaken over time if liquids containing oil, such as baby oil, are used, it is recommended to only use water, soap and shampoo in the FlexiBath. This way, your tub will last for a very long time. The FlexiBath is recommended for children ages 0-4 years old, which means that it can be used long after an infant tub has become too small. It is very simple to open and close...simply pull or push the sides of the tub open or shut. There is also a latch on top to keep the tub closed once you have pushed the sides together. This latch ensures that you can easily store the FlexiBath upright as well. Even though the sides of the FlexiBath are smooth and slick, the bottom of the tub is not. 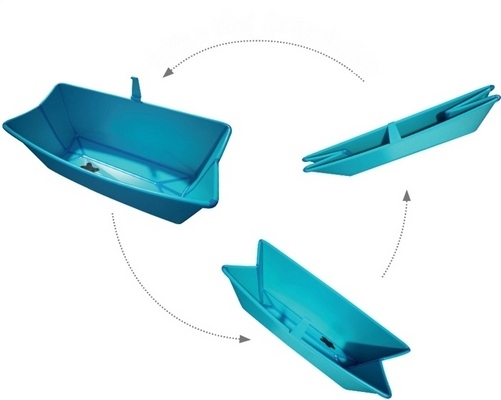 The bottom of the FlexiBath has been coated with a non-slip surface for the comfort and safety of your child. As you can see in the bottom right picture, the FlexiBath also has a removable bath drain so that you can drain the bathwater out of your tub when bath time is over. I DO NOT recommend removing it however. I found it next to impossible to put this plug back in the hole, once it was removed. It is much simpler to just dump the water out of the side of the tub, since the walls aren't that high anyway. I think the bath plug is unnecessary and way too difficult to get back in. Now, because Riley is 21 months old, and is used to bathing in the regular bath tub, I haven't actually bathed her directly in the FlexiBath yet. But that doesn't mean that I won't use this with Riley though. I think the FlexiBath is a great portable tub that I can take with us when traveling. Also, I plan on keeping this readily accessible in our downstairs closet so that the next time Riley decides to make mud pies, I can give her a bath right there on the spot outside in the FlexiBath! 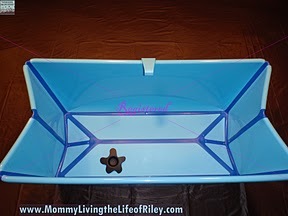 As Riley gets older, I can even use the FlexiBath for a stylish toy storage bin, which can easily fold up and store under her bed when not in use. Riley can also use this bath tub to give her "dollies" a bath! Because of its great design and practicality, I highly recommend the FlexiBath. You can use it with children 0-4 years old, it's super easy to store and there are a ton of wonderful uses for it after your children have long outgrown it too! Disclosure: I received the FlexiBath from EasyWalker Inc. in order to facilitate my review. No other compensation was received. This product review is based on my own personal experiences with this item and is completely honest and objective.